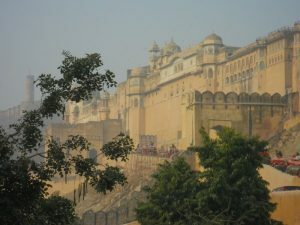 p early and off to the Amber Fort, a sprawling hilltop fortification that wends around the nearby valleys like some sort of circular Great Wall. The structure was absolutely breathtaking, hanging on its crags in the morning haze. Rode up to the top on the back of an elephant, giyap, which swayed so much my hips hurt. Still, it was something to find yourself atop a huge moving creature on a cliff road, looking out over your feet and way way down to the Maotha Lake (with its gardened island). Now, you gotta understand that hawkers are a rupee a dozen on the slope and a number of them took our pictures. We’ll see more of them later in the story. After dismounting, we worked out way through the exotic fortress, marveling at the stunning vistas out every ornate window, all while monkeys scampered across the rooftops. During this time, the first of a hawkers found me and sold me some nice photos of JB and myself on our elephant. Tucking these away, we continued. After taking something like a hundred pictures of structures and skylines suitable for a fantasy novel cover, we finally had to exit to the jeep loading area for the ride down. And here the jabbering hawkers descended. There were cripples and trinkets and carved this’s and peacock that’s. One guy (who also had pictures of us) dogged me all the way to the jeep, something like a hundred yards of snarling parking lots, revving engines and total confusion. I felt like I’d need to pry him off with a boat hook. Finally we were rattling down the rough streets in full dive-bomber descent, nearly running down chickens and slow natives alike, to empty into the bus staging area with its own multitude of wailing venders. 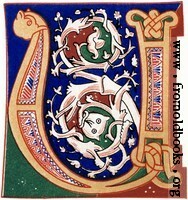 Once we were done with them, it was off to a textile mill to see how all sorts of things were done. Of course there was a rug sale at the end of it and I really enjoyed the rum-like drink and pakoras. But no, I don’t have the floorspace for another rug. Already got the ones from Tunisia (Mookie the Cat’s horizontal scratching post). 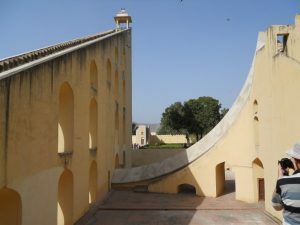 Then it was the Jantar Mantar Observatory. There was one of these in Delhi – saw it from the bus window – and evidently the ruler who installed four of them (in different cities) wanted them all synched. But ‘observatory’ was a small misnomer – they weren’t using these to plot the planets – the massive wedge-shaped structures were little more than glorified sundials, as critical time calculation is required for jumbo-jumbo astrology. Let’s just say I don’t put a lot of faith into that field. Last was the City Palace (right next door) where we checked out the various museums (accompanied by flanking self-appointed, tip-thirsting guides). Still, got to see a neat weapons collection and JB got a textile display, so everyone got something. Stood around waiting for the group in the central courtyard, and watched a vanquished fighting kite flutter down out of control against the smoggy sky. The big surprise was when I got back to the bus – the photo-spammer who’d chased me down to the jeep was there. He came around the corner waving pictures and I thought you’ve got to be kidding me! But it makes sense – he knows which tour group we are in (he’s got our badge in his picture) and he knows our times and destinations. So rather than just dump all the photos, he and his buddies descend to Jaipur, go to the afternoon tourist sites and try to squeeze out a final sale. Man, he followed me right to the bus steps and then stood outside my window, waving his photos. I just slumped in my seat with my hat pulled down. In retrospect, I wished I’d bought them. He put so much effort and raw chutzpa into the effort, I should have given him a couple of bucks. Tomorrow is another day on the road with a late start – we could use it. As for tonight, our plans of going into town have become subdued with fatigue – Pat is meeting us in a short while for dinner in the hotel restaurant. We’ve got packing this evening.